high voltage cables, plus the added benefit of retarding and deterring corona discharges. and a color-coded jacket overall. MIL-W-22759/1 (Class 1: Stranded Silver plated conductor for +200°C). MIL-W-22759/2 (Class 2: Stranded Nickel plated copper conductor for +260°C). CONSTRUCTION VARIATIONS ARE AVAILABLE TO ORDER. DESCRIPTION: .010" wall of PTFE, 600V, 200C. DESCRIPTION: .015" to .017" wall of PTFE insulation, 1000V, 200°C. DESCRIPTION: .005" to .006" wall of PTFE insulation, 250V, 200°C. DESCRIPTION: Stranded silver plated copper, .010" wall of PTFE insulation. UL Style 1212 (+80°C) is available to order. DESCRIPTION: Stranded Silver plated copper, .016" wall of PTFE insulation. UL 1624, 80°C, 150V, .010" wall (300V peak for electronic useage if within conduit). FEP, PFA & Silicone rubber constructions based on our 1250/ & 1251/ series are available to order. available to order. *Breakdown Voltage. 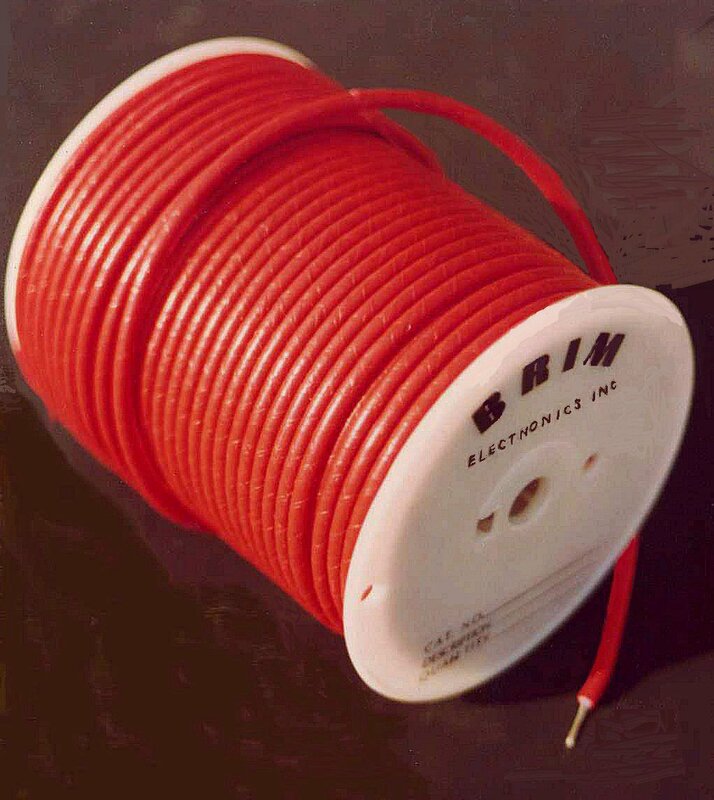 given voltage, then that used for many other resins, the finished wire is lighter & often more flexible. STD.COLORS: Black, Red. OTHER COLORS AVAILABLE TO ORDER. STD. COLORS: Black, Red, White, Blue, Green. OTHER COLORS AVAILABLE TO ORDER. DESCRIPTION: Stranded tinned copper conductor insulated with Rubber, seperater, waxy smooth finish. low temperature capability, with a high voltage rating. Kinkless. OPER. TEMP. :-20°C to +60°C. OTHER COLORS AVAILABLE TO ORDER. OTHER CONSTRUCTIONS ARE AVAILABLE TO ORDER. N-46026A. Rated for 100Volts RMS* for dry locations. nated with a silicone varnish over a stranded nickel-plated copper conductor. with a silicone varnish over a stranded nickel-plated copper conductor. * 600V RMS is available to order. CONSTRUCTION VARIATIONS ARE AVAIL. TO ORDER. All of these constructions are RoHS compliant. PTFE impregnated Fiberglass braided jacket overall. OPER. TEMP. : -320°F to 2500°F. Oper. Voltage: 600V. All components are RoHS compliant. of extruded Kyner** (Polyvinylidenefluoride). OPER.TEMP. : +105°C. OPER.VOLT. : 300V. OTHER UL STYLES ARE AVAILABLE TO ORDER. KYNAR** WIRE CUT & STRIPPED TO SIZE IS AVAILABLE TO ORDER. extruded Kyner** (Polyvinylidenefluoride). OPER. TEMP. : +135°C. OPER. VOLT. : 300V. chemicals, solvents, weather, ultra-violet rays. Kynar** is self-extinguishing. MIL-W-16878/29 (Ty.F 600V) or MIL-W-16878/30 (Ty.FF 1000V). OPER. TEMP. : -55°C to +150°C. Constructions with a braided Fiberglass jacket are available to order. RoHS compliant. power factor, low dielectric constant. RoHS compliant. STD. COLOR: White conductor/White glass braid. Other colors are available to order. Constructions meet UL 3239 for 150°C, UL VW-1. RoHS compliant. insulation or PVC with a Nylon jacket insulation rated for -55°C to +105°C. PVC insulation, or PVC with a Nylon or glass braided jacket. OPER. VOLT. : -40°C to +80°C. OPER. VOLT. : 600V OPER.TEMP: -40°C to +105°C.